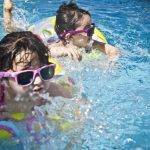 The actual pump run time you need primarily depends on the relative size of your pool, the pump flow rate, the amount of debris that falls into the pool and the use of solar panels (or not). Every pool is different and each pool owner needs to figure it out for themselves. Historically, the rule of thumb has been to run the pump at least 1 turnover per day. However, that has turned out to be a very poor indicator of actual required pump run time. There are several objectives for pump run time. First, it is very important to add chlorine to the pool in order to reach FC targets. 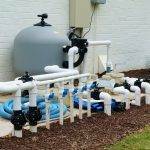 For TFPC pool owners, this can amount to only 30 minutes of run time while adding chlorine for distribution, whereas an SWG pool owner may require much more run time depending on the capability of the SWG unit. Second, pump run time is necessary to keep the pool free from debris. This is more about aesthetics which can vary considerably depending on the owners personal preference. Lastly, you may need to run the pump to heat up the pool (solar or other) but that is more an option rather than a necessity. Next, studies have shown that a typical pool really only needs about 4 hours of run time for proper chlorination, circulation and cleaning. So our recommendation is to start off with 4 hours of run time if your pump is single speed and 8 hours of run time if your pump is capable of running on lower speeds (i.e. two speed or variable speed pump). If this amount of run time is not sufficient to keep the pool clean enough for your preference, then gradually increase the pump run time until it is clean enough for your own tastes. Also, if your controller is capable of split run time, there can be some skimming benefits to splitting up the run time. However, much more run time may be necessary for significant events such as opening a pool, new pools, or when you are having any kind of algae problem so only reduce run time when the pool has stabilized. One thing to keep in mind is that pump run time does not prevent algae, only maintaining a proper chlorine level can do that. For SWG owners, remember that the SWG % setting will need to change any time you change the pump run time to hit the FC target. Also, as pool temperatures rise, the chlorine extinction increases so not only will SWG % need to increase but pump run time may also need to increase if the setting is already close to, or at, 100%. It is important to remember that as the water temperature increases during the summer, chlorine extinction will increase so you may need to add more chlorine to the pool which may or may not require more pump time depending on the method of chlorination. The opposite of this is true for the winter. 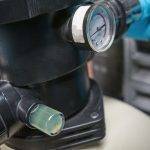 As water temperature drops and the sun gets lower in the sky, chlorine extinction drops and both the amount of chlorine that is added drops and potentially, the amount of required pump run time can also drop.